Somerset Homecoming is the story of one woman’s unflagging efforts to recover the history of her ancestors, slaves who had lived and worked at Somerset Place. 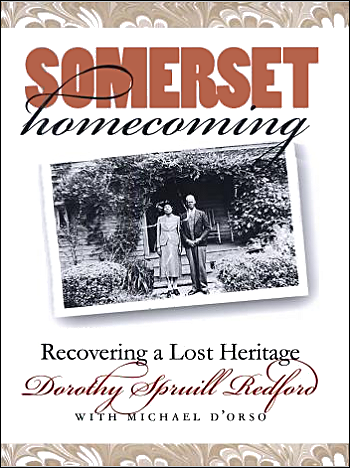 Traveling down winding southern roads, through county courthouses and state archives, and onto the front porches of people willing to share tales handed down through generations, Dorothy Spruill Redford spent ten years tracing the lives of Somerset’s slaves and their descendants. Her endeavors culminated in the joyous, nationally publicized homecoming she organized that brought together more than 2,000 descendants of the plantation’s slaves and owners and marked the beginning of a campaign to turn Somerset Place into a remarkable resource for learning about the history of both African Americans and whites in the region. This poignant, personal saga of black roots and branches is recommended for Afro-American, Southern, local history, and genealogy collections. Note: Somerset Place stands today as a rather remarkable historic site. It offers an interpretive tour that meshes the lifestyles of all of the plantation’s residents into one concise chronological social history of the plantation’s 80-year lifespan. I had just gotten off a cargo ship in Antwerp, Belgium, after four weeks of writing at sea, and I was on a flight to Los Angeles when I saw a story in USA Today about Dorothy Redford and her reunion of slave descendants at a North Carolina plantation. Dorothy had written to me several times over the previous years about her personal search for her own slave ancestors and her subsequent study of the plantation and its slave community. I had responded with encouragement and what advice I thought might help. When her last letter invited me to attend a homecoming at the site, I wrote back that I could not attend because of my own plans to be at sea. Now, airborne back to America, I realized I had not yet missed the event. From her letters, I knew what a beautiful piece of work Dorothy had been developing, and I was excited at the possibility of our meeting, of seeing the site she had studied for so long and of witnessing the heartfelt, human gathering she had brought about. When I got to Los Angeles, I showed the newspaper article to two lifelong friends of mine from our tiny hometown of Henning, Tennessee, and purely upon impulse, we caught the first plane to Norfolk. There we rented a car and drove south into the North Carolina countryside and finally arrived at the Somerset Place plantation in the midst of the celebration. I was thrilled—thrilled not just at what was happening there that day, but for all the connections that such a gathering of families spoke of—for the thread that ran back through the generations and will most surely run ahead into the future. To see those scores of families, all returned to the soil of their ancestors, resurrecting the spirit of their kin who came before, made me think of what, I believe, was certainly my most dramatic moment in the making of Roots. We were in Savanna, Georgia, getting ready to film a scene where Kunta Kinte refused to call himself by the name his master had given him. The master had decided Kunta’s name would be “Toby.” The overseer was giving the word, and he passed it to the old slave who was training the young Kunta. That was the scene to be filmed that day. Levar was brought out and tied with his wrists to a set of crossed poles, much like an Indian tepee. As he hung there, to his right sat the old slave, Lou Gossett, who was being punished for his inability to get the young slave to say the name and who would be needed to help remove the young slave after what would surely be a terrible beating. Smirking, the overseer looked over at a tall, anonymous slave in the background who was holding a whip, and this slave walked out into camera range, raised his arm and began. The whip they were using was made with loosely woven hemp, nothing that would hurt anybody. But a trained actor knows how to jerk the instant it touches his skin, making the force and sting of the blow appear painfully real. Levar took two blows, then a third, which, with the special effects people’s blood capsules breaking, was almost too much to look at. After three more blows, and more blood, the thirty-five or so of us just out of camera range were so angry we were ready to charge out there and choke somebody. Then the tall slave who had done the beating cut Levar down, and Levar slumped into Lou Gossett’s lap. Gossett, an experienced veteran actor, was supposed to embrace the young slave, to comfort him. One camera was to slowly slide out of focus, as an optional way to end that two hour episode. But what happened is something that people who spend their entire lives around films being made may witness but a few times—when experienced actors or actresses totally forgot who they are and become the role they are portraying, letting what’s inside them take over. When Levar slumped into Lou Gossett’s lap, Lou’s own body began convulsing. He curled into a near-fetal position, grasping Levar to his own shaking self—and out of Lou’s voice box, through his tears, came a hoarse, guttural cry. He paused. Silence. Then he repeated it. Maybe ten seconds passed, then the last film was clicked through three cameras. The only sound was Lou’s weeping. Then he pulled himself back, out of the role, into the present. Years have gone by since that afternoon in Savannah, Georgia, but I have never been far from that cry or from those words: “They’s gonna be a better day.” Because that is the cry that was being cried by all the people—the black people, the white people, the red people, the other people living in the time that scene depicted. That was the cry that was heard on Somerset Place plantation, from one end to the other, and on every other plantation like it. That was the cry that came from people praying not just for themselves, but for their children and for all those who would follow them. That life would be better. That there would be a better day. What compelled me to come to Somerset Place for its home coming was to see that better day come alive in a setting like that. And it gave me the chance to witness what a marvelous thing my colleague has done. Dorothy’s study is the best, most beautifully researched and most thoroughly presented black family history that I know of. I don’t believe I could imagine a better answer to the prayers of her relatives’ foreparents—of all our foreparents—than what she has brought together and created at Somerset Place and the story she tells in these pages.